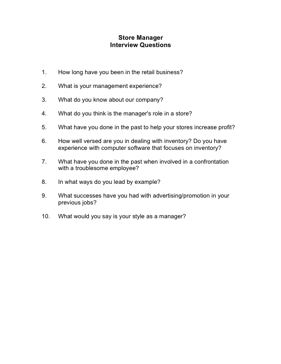 Choose your next Store Manager with the aid of these helpful interview questions. 1. How long have you been in the retail business? 4. What do you think is the manager's role in a store? 5. What have you done in the past to help your stores increase profit? 6. How well versed are you in dealing with inventory? Do you have experience with computer software that focuses on inventory? 7. What have you done in the past when involved in a confrontation with a troublesome employee? 8. In what ways do you lead by example? 9. What successes have you had with advertising/promotion in your previous jobs? 10. What would you say is your style as a manager?